Anatomically designed to ensure a comfortable fit. Perspiration is absorbed by a self wicking lining and increased ventilation is provided by perforated blue foam. 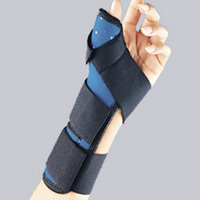 Ideal for arthritis, DeQuervain's Syndrome, tendinitis, and post thumb injuries. Closure straps are stretchable for ease of application and removal.